Let’s be honest, most work-horse writers cannot make a living by advances alone. However, if you combine writing with speaking and profitable back-of-the-room sales, look out! Writing, speaking and book/product sales is a true triple whammy, each avenue supporting the other. Each leg of this career stool brought in roughly one-third of my income. Here are some ideas for a money-making book table. Bundle items into gift bags. For example, I would put my humor books for moms in clear gift bags with a pretty sheet of tissue paper and call it “Laughter Rx for Moms.” I created another bag I called “Smiles for the Stressed-Out Soul” that included my books on slowing down and thriving. 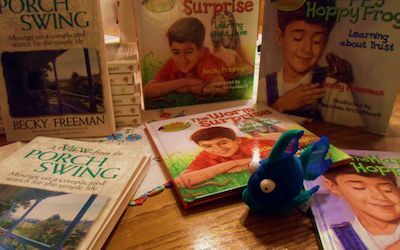 People want to give their friends some tangible love, so selling your books in gift bag form makes them instantly ready to share. I wrote four books for young kids (Gabe & Critters) and five “first chapter” books for ages 7-11 (Camp Wanna Banana). Moms and grandmas love to buy something for children. I found darling finger puppets, cute plastic “bookworms,” and small plush spider monkeys that tied in with the books’ themes. The eye appeal of colorful items surrounding the books proved irresistible. It took time to find items that were lightweight, small, fun, sturdy, and profitable. But when I did, books flew off the children’s section of my table. In what I now view as a great business opportunity, two of my books went out of print. I negotiated to buy a literal truckload of them for 72 cents each. I bought 10,000 books and filled up an empty guest room, wondering what in the world I had done. However, I sold every book by offering them “2 for $5.00” to retreat attendees. A profit for me, and a great deal for them. The event planner put a coupon in the retreat bags for this “special bargain,” ensuring a rush to the book table. I quickly discovered that women wanted to take my “retreat talks” home or share with a friend. So I had audio CDs made of my talks and called them “Girlfriend Getaway.” I sold four talks for $15.00. My investment in the CDs (including case) was only $3.00 each. Many speakers create their own workbooks or study guides to go with their books and make a nice profit. I am turned off by speakers who hawk their books like an infomercial. I’ve found it much more natural to say, “In my book, Worms in My Tea, I told a story about a time when …”, then simply tell the story. People would always show up at the table asking for the book that contained the story I told. The greater the variety of books you have on your table, the higher the profit; however, you don’t have to author all the books you sell. If you refer to books by other authors in your speeches, negotiate with a publisher to buy them in bulk at a good discount and sell them on your table. Or sell other product-tie-ins. If you wrote a cookbook, you might sell adorable aprons. If you teach writing classes, you might offer pens and blank journals that have fun literary themes. In a packet of information that I would mail ahead or email to the event planner, I included a Book Description Sheet. It had the picture and title of each book with a one or two sentence description below it. This would help volunteers get quickly familiar with the products. Always ask for at least two volunteers to help with the book table, giving them free books as a thank you. After you speak, women will want to chat and have you sign books, so having others take care of the money exchange is essential. Create a cute bookmark to be tucked into the books you sell on your table with information leading to your website, other books, etc. I typically only put about ten copies of each book on the book table at a time, re-filling it from a box under the table as they sold. Make clear concise signs to prop up on your table that clearly show the price of your books. Go for visual clarity rather than cuteness. And be sure to take credit cards; it greatly increases sales. I hope these tips prove helpful to you and increase your profits as you speak and write. Feel free to ask me any questions. What advice do you have for other authors to help sell their books? This entry was posted in Marketing and Promotion and tagged back-of-the-room book sales, Becky Johnson, book sales, book table sales, Camp Wanna Banana, Gabe and Critters, profit, speaking, Worms in My Tea by Becky Johnson. Bookmark the permalink. Excellent ideas Becky. You gave me some new strategies. You are very correct–I have made a decent living for seven years now using your triple whammy of writing, speaking, and back of room sales. Thank you Rick! So encouraging to hear this. I forgot to admit, I knew nothing about speaking when I began and was beyond terrified. I put some of my first advance money into a very intensive speaking coaching class right away. It was worth every penny. In fact, I made triple what I paid the speaking coach on my very first big engagement. I had so much to learn… but if I can do it, anyone can! Shellie, isn’t it fun to see what other writers and speakers do? Sharing ideas helps everyone! LOL! So many authors are so devastated when the publisher takes their book out of print; but if you can almost always negotiate a wonderful deal for the leftovers and sell them at a huge profit, and you may make more money than you’d have made on royalties. Always a silver lining to OP books, if you are a speaker. However with POD (print on demand) and e-books, authors don’t have quite as many opportunities to by truckloads of their OP books anymore. Mindy, so glad to hear this. I hope my ideas will just be a springboard to even better ideas that fit your particular brand and personality! Ah, thank you Barb! So encouraging. Was lots of fun to write and remember. Loved these ideas, Becky! Will share and bookmark. Loved these ideas, Becky! Will bookmark :). Thank you Gillian. So kind of you! Becky! Great tips as always…of course I usually DO learn something from you. 🙂 I have seen you in action and you are a wonder to behold. Love you. Super tips. I especially love the bookmark and the giftbag ideas! I’ll remember those for the next book. Thank you! Thanks Becky, these are so helpful. I hope someone will do a post about whether or not you have to charge tax and how you do that. Wow. I don’t even have a book out, and I loved this post. Great ideas here. Thanks. One day I’ll have some books out and I’m going to use these ideas.